Dragonfly Garden Lantern - available in two lantern designs and two mounting styles. The Dragonfly design Garden Lantern is perfect for lighting the way on a path or walkway leading to your home or business. Our lanterns are hand made of solid brass. 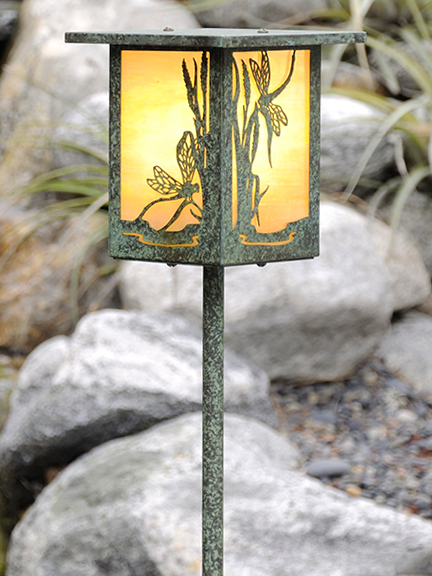 The Dragonfly Garden Lantern can be customized with your choice of 3 finishes and 3 glass options. Each fixture is supplied with a heavy duty ground spike, two waterproof electric connectors and a 3.5 watt LED bulb. American Made.